Designed by accounting professionals and FileMaker experts who know from deep experience what it takes to run a business, Genesis Accounting is the most robust accounting package available for the FileMaker platform. Together with Genesis Business Metrics and Genesis Transactions, Genesis Accounting forms the cornerstone of the powerful Genesis Financial Suite. Every business is unique, but accounting is largely constant. We configure Genesis Accounting to serve your specific needs, giving you one integrated solution to streamline workflows throughout your organization while retaining accountability and management control. Genesis Accounting allows you to tailor your FileMaker solutions to your needs while knowing your accounting is rock solid. 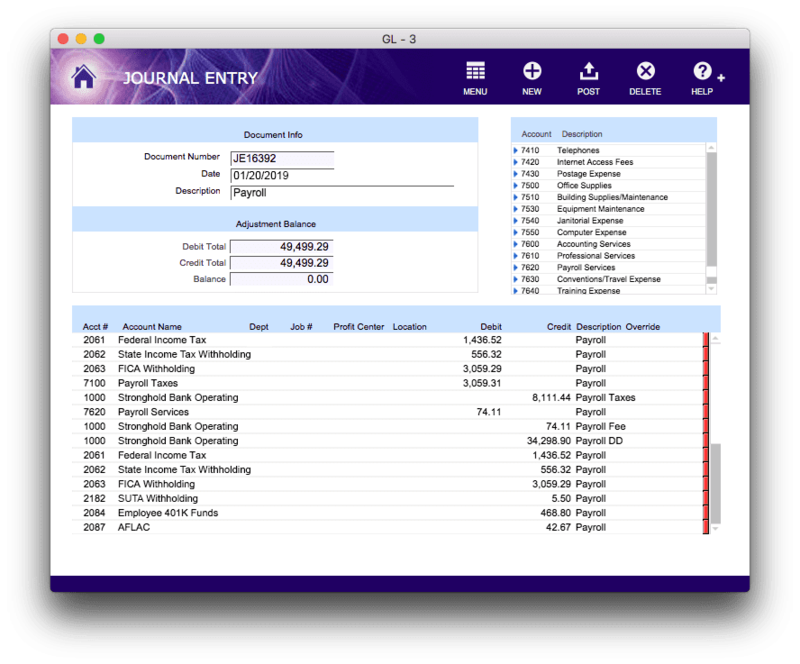 Use Genesis Accounting right out of the box, and adapt it to your business with all the capabilities of the FileMaker platform. Use Genesis Accounting with Genesis Financial Suite or integrate seamlessly with your own existing FileMaker solutions. Work with other business apps and fold it into a broader technology mix using industry-standard APIs. Genesis Accounting adds extensive accounting capabilities to your existing FileMaker solutions while leveraging mature, proven technology. On the market for nearly two decades, it has been tested and put through its paces by thousands of accounting clients around the world. Post individually or batch-process to save time and clicks. Import entries from Excel, or quickly enter data manually. Genesis works the way you do. Balance Sheets, Income Statements, Transaction Journals and Bank Registers — all with drill-down details, user-definable data ranges, and more. Print, Export or Save as PDF without any additional software. Tune Genesis Accounting with your company brand, multiple business entities, aging periods, and other preferences. Configure powerful account segments for flexible reporting and searching. And, of course, leverage the full features of FileMaker. Drive change with your own custom apps. 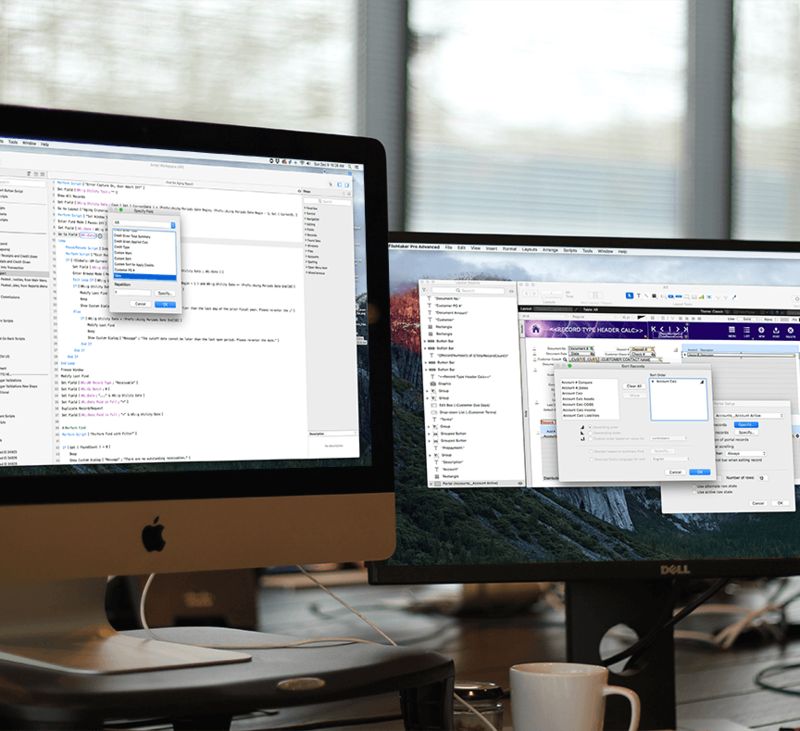 The FileMaker platform can help your team break out of “the work rut” by delivering custom apps that replace manual processes, save you from death-by-spreadsheet, and reimagine cumbersome workflows. Secure your data and take control by managing who has access to what. Work from anywhere — desktop, mobile and web. Host in the cloud or on your own server. We’re FileMaker experts, through and through. We’ve been developing FileMaker apps for decades. We’ve spoken at conferences, written books, delivered training, created plug-ins. Codence was one of the first teams invited into the FileMaker Business Alliance, and we’re proud to be Platinum partners to this day. Flexible searching and reporting, drill down into GL detail directly from financial statements; work with up to 18 open months, lock prior months by sub-ledger as desired; view archived data easily. 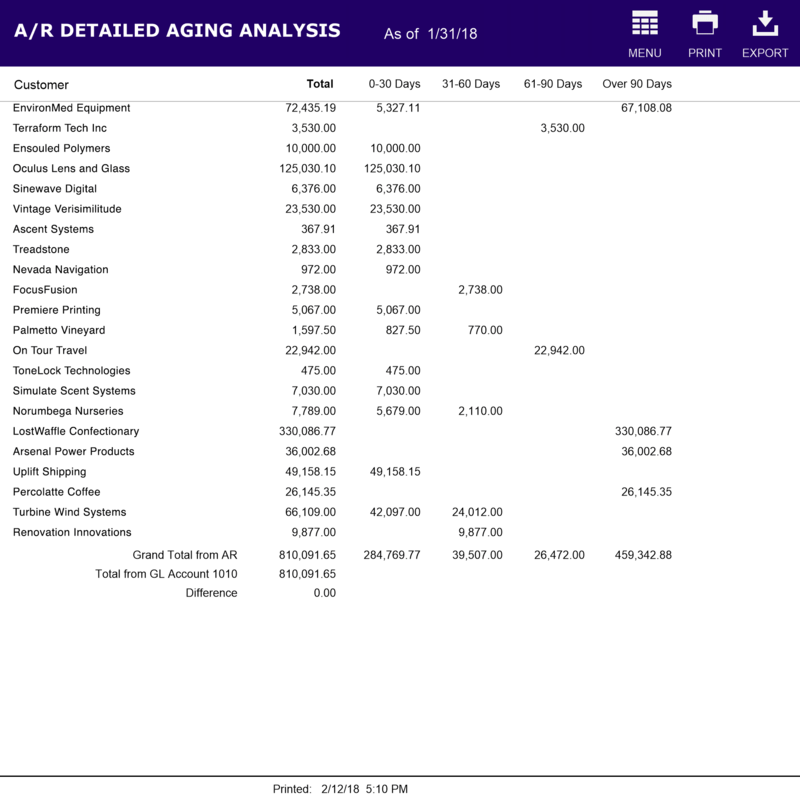 Enter directly in AR or post from your front-end FileMaker file; create and apply prepayments, make bank deposits; reports include Aging Detail, Aging Summary and Transaction History. 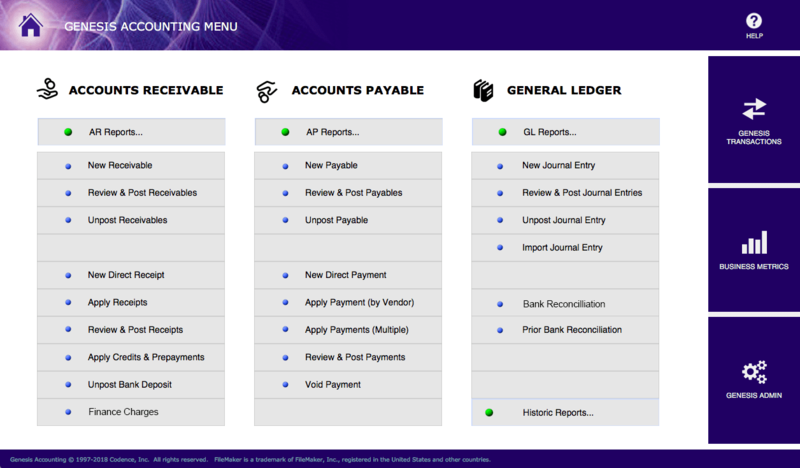 Enter directly in AP or post from from your front-end FileMaker file; print checks; make electronic payments; reports include Aging Detail, Aging Summary and Transaction History. Create Journal entries directly or import them from Excel; post them automatically from your front-end FileMaker solution or from Genesis Transactions. Easy to use bank reconciliation, work with unlimited bank accounts; review previous reconciliations, reconcile any account (such as credit cards). Standard Income Statements and Balance Sheets, plus more detailed P&L’s by profit center; twelve month or comparative income statements; drill down directly from financial statements to underlying transactions. Speak to one of our expert consultants about Genesis Accounting today. During this free consultation, we’ll address your questions, learn more about your business, and make some immediate recommendations.